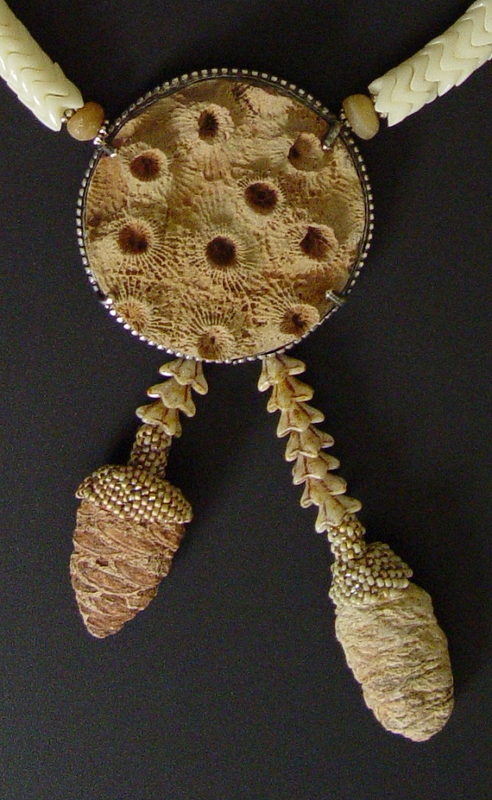 Djenne agate beads from Mali marked "possibly Neolithic"
There are photos of similar fossil corals online (it made me laugh to find one on e-Bay listed as "used"). Some redder versions are labeled Pachyphyllum sp. and others are labeled Hexagonia sp. Both are from roughly the same time frame given for this lovely coral give or take a few tens of millions of years. The prefix "pachy" means "thick" and it occurs in a great many plant names as well as animal names like "pachyderm." The prefix "hexa" means six, and in some photos you can make out six-sided bases beneath the volcano tops. If you have an imagination you can see vague hexagonal structures in this piece too, so perhaps it is a Hexagonia. Leigh polished the back of this coral and I left the back of the setting open so you can see it. Suffice it to say the top is vastly more interesting although perhaps an expert could use the back to help determine the classification. The Pararaucaria cones are also fascinating specimens. The documentation that came with them listed a different spelling but I was finally able to track them down by searching for something like "fossil pine cones from Patagonia." I think perhaps Pararaucaria is the proper spelling because "araucaria" is a genus of trees (the most familiar living examples may be the monkey puzzle tree and Norfolk Island pine) and the prefix "para" is a Greek word meaning "from, beside, by" and used as a prefix it includes the meaning "resembling." If you are interested in botany, you realize that the pines and the araucarias are in the same order (Pinales) but different families. Both produce cones. Where our fossils fit in the evolutionary scheme will have to await comments from an expert. 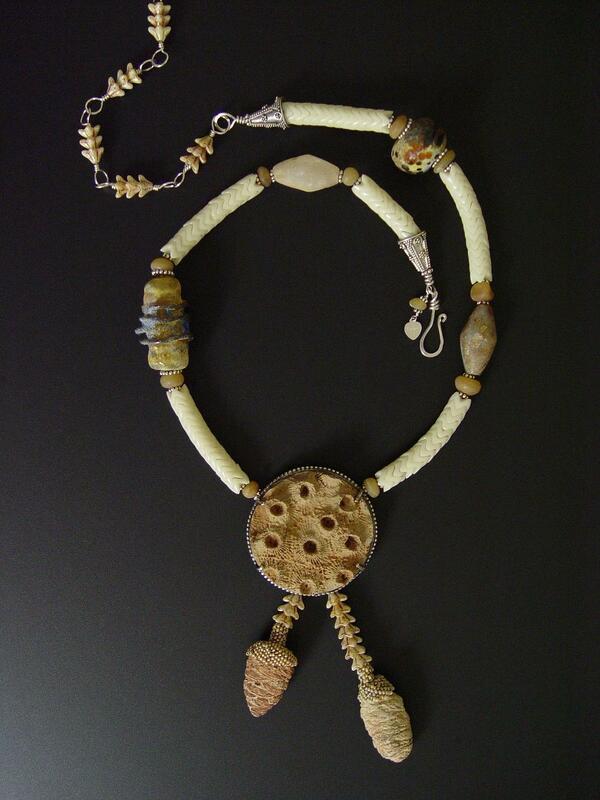 Karen Ovington's beads could be mistaken for artifacts from another time. 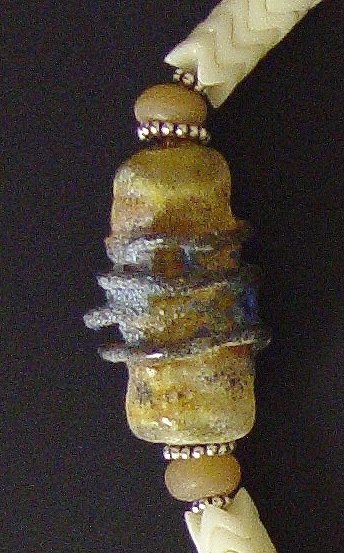 The old Djenne agates and Czech snake beads complete the composition. 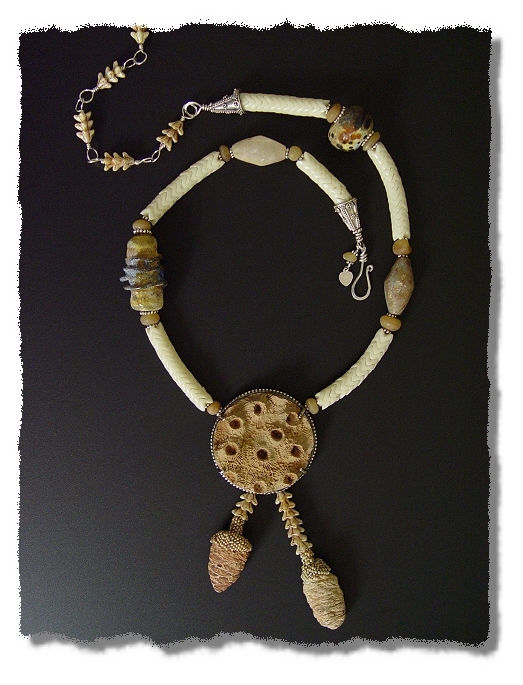 I do hope you will order this necklace and wonder at the creatures which left such striking evidence of their lives so very long ago.